Have you ever wondered how to create a beautiful floral crown? These lovely “wearable arrangements” are extremely popular for weddings, birthdays, anniversaries and more. In this short video I want to show you to how to make your own basic floral crown at home. In case you missed it, watch part 1 of this series about creating a ribbon wrist corsage. 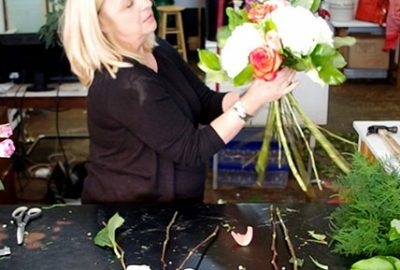 A lot of men and women inquire about learning floral design, so back in 2012 we founded the Toronto Flower School. In this short video I wanted to share a simplified tutorial about hand tied bouquets which is a key skill and more difficult then it looks. This is also where we start our TFS training. Ribbons form an important part of any sympathy arrangement; however these lovely accents are often overlooked. So in this short video I wanted to share a few pieces of information about sympathy ribbons you may find interesting. You have plenty of options at your disposal when selecting funeral floral arrangements for sympathy occasions. In this short video I want to share a few ideas for you to consider when choosing a sympathy arrangement to best suit the individual receiving. Do you also love garden flowers and garden bouquets? Right now garden florals are a very hot trend, so I thought I would make a short video about how to start assembling your own basic bouquet of garden flowers. Our customers often ask our opinion about what type of message they should include with their sympathy arrangements. The passing of a loved one is a delicate and sensitive time so the message must reflect this, therefore I decided to make a short video to explain your 2 best options when deciding on your sympathy card message.